We took a fascinating boat ride up Newtown Creek on Sunday morning with the good people from the Brooklyn Center for the Urban Environment. 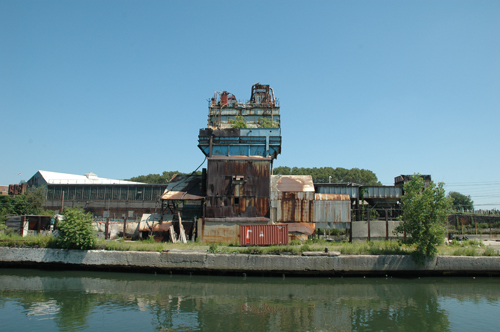 Newtown, which forms the boundary between Brooklyn and Queens, is the most polluted body of water in New York City (sorry, Mr. Gowanus), presenting a multiplicity of cleanup issues both in terms of the creek and various parcels of land along its shores. Newtown is the scene of the Greenpoint oil spill, one of the nation's largest, and the former home of a Phelps-Dodge copper smelter that left behind a Superfund site. 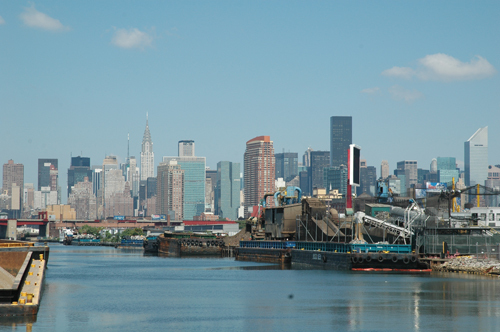 Newtown's banks are still lined with industry and facilities, including many scrap metal and recycling operations, the sci-fi Greenpoint Sewage Treatment Plant and oil storage facilities. Along the way, GL spoted one person and six Canada Geese, the latter under the BQE's Kosciuzsko Bridge. We failed to identify the source of the nauseating garbage smell that, in summer traffic fills one's car on the bridge, but do note that it's far more pungent on the creek itself. These vistas are unusual because the only way to see them is by boat. 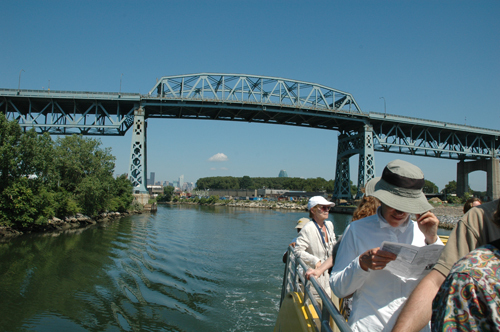 There is virtually no public access at any point along the canal, noted our excellent tour guide Jack Eichenbaum, other than from one of the bridges over the creek or from the end of Manhattan Avenue in Greenpoint, where a small park is currently under construction. 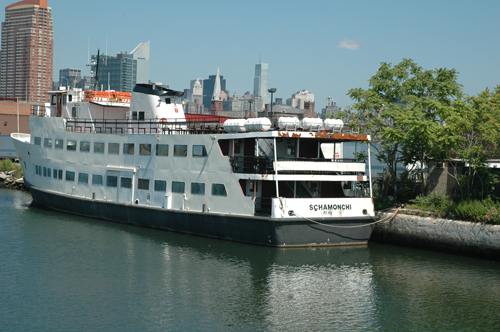 One of the boats docked along the creek, on the Queens side. 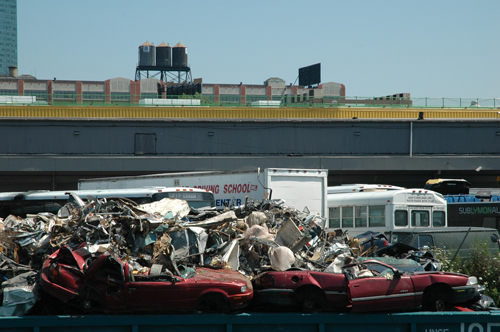 Dead cars on a barge and a "Driving School" tractor trailer in the lot. 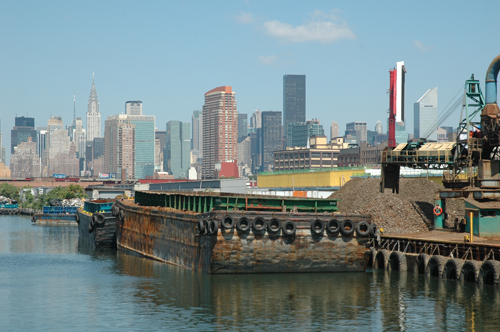 One of many, many barges on the creek. 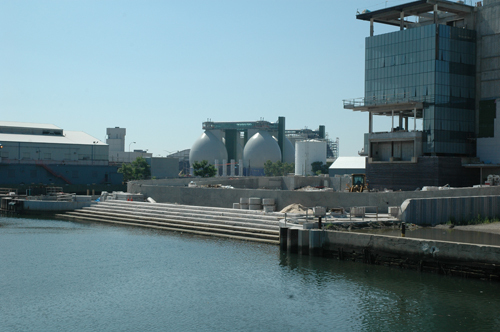 The Epcot Center-like Greenpoint Sewage Treatment Plant. A bit of the NY Water Taxi that functioned as tour boat.